Foreclosed houses can offer homebuyers a chance to invest in the housing market for far less money than they would normally be able to. But those steep discounts often come with some risk. 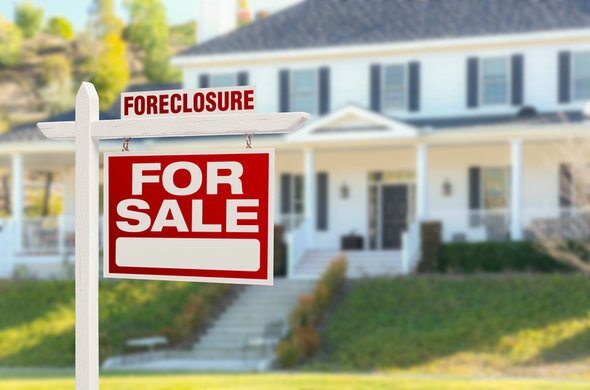 There are often legal holdups making the foreclosure market different than the rest of the housing market and there is no guarantee that a foreclosed home can later be sold for a profit. In order to find the best states to buy a foreclosed house, we looked at data for all 50 states. Specifically, we looked at data on foreclosure rates, the percent of mortgages which are delinquent, changes in home values, population and housing stock, the average process period for a foreclosure and the redemption laws in each state. Read our data and methodology section below to see where we got this data and how we put it together to create our rankings. Look to the coasts – Several coastal states appeared in our top 10, including Florida, Georgia, South Carolina, Maryland, Massachusetts and Oregon. The states tend to have higher foreclosure rates as well as large increases in demand for housing. Florida and Nevada on top – Florida and Nevada take the top spots in our study with scores of 100 and 98.71, respectively, on our index. The state in third is Hawaii, which scored 23 points lower than Nevada. Retiree states – Many of the states which topped our study of the places where retirees are moving also appeared in the top 10 in this study. Those states are Florida, Arizona, South Carolina, Georgia, Texas, Oregon and Nevada. Florida may be your best bet if you are looking to buy a distressed property. The Sunshine State has the highest foreclosure rate in the country at 7.9% and around 3.64% of all mortgage debt is delinquent past 90 days. Not only is there plenty of distressed property in Florida, but property in Florida is a good investment as well. In the past five years, median home values in Florida have jumped almost 20%, the sixth-highest rate in the country. 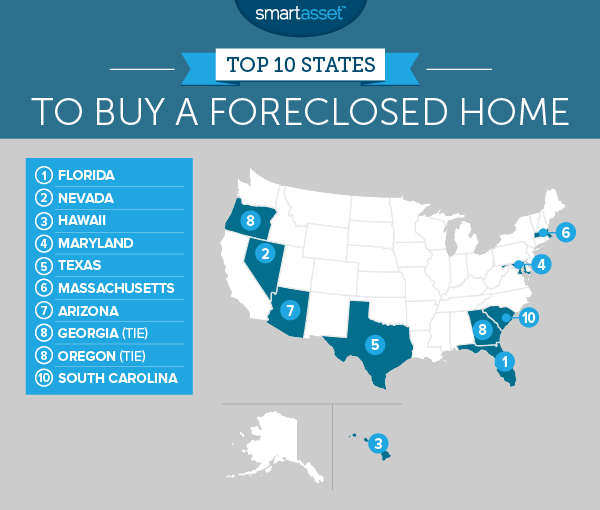 Nevada comes in right behind Florida as the second-best state to buy a foreclosed home. The foreclosure rate in Nevada has been steadily declining from its high of 9.1% in December of 2010 down to 3.1% in June 2014. However that 3.1% foreclosure rate is still the seventh-highest in the nation. From 2011 to 2015, the Nevada population outgrew the housing stock growth by 3.96 percentage points. This means there will likely be an uptick in the demand for housing. In fact, we have already started to see that. In the past five years, median home values have risen 40% in Nevada – that’s second only to North Dakota. Hawaii scores in the top 10 in four different metrics. In June 2014, Hawaii had a foreclosure rate of 5.8% – the fourth-highest in the nation. And from 2011 to 2015, the population outgrew new homes by 2.2%. But Hawaii is less competitive when it comes to legal red tape around foreclosures. Data from RealtyTrac shows that it takes about 220 days to process a foreclosure in the Aloha State, one of the longest wait times in the country. In Maryland there is plenty of opportunity to purchase a foreclosed home. The state has the eighth-highest rate of delinquent mortgages and the ninth-highest foreclosure rate. You may not have to deal with a ton of legal issues either as the processing period for a foreclosed home in Maryland is only 46 days. However, Maryland property investments lack some of the upside the other states have. Median home values here have only grown 4.4% in the five-year period from 2011 to 2015. Texas is home to some of the biggest boomtowns in the country, so it is not surprise to see that buying property in Texas can be a worthwhile investment. If you are looking for a foreclosed home in Texas, you may have to do a bit of digging. The state has a relatively low foreclosure rate of 1% and only 1.43% of mortgages are delinquent. However, if you do find one it could pay off. Texas has the least red tape in the country when it comes to foreclosures – the process period here is only 27 days. And for those who do manage to buy a foreclosed home there is tremendous upside. Median home values rose almost 20% from 2011 to 2015. The Bay State has recently seen a surge in demand for housing. Population growth has outpaced housing stock growth by 2.19%, and median home values grew almost 8% from 2011 to 2015. Those are all good signs for someone looking to invest in housing. Massachusetts may also be a good state to buy property to live in as it has one of the best education systems in the country. However, the foreclosure rate in Massachusetts is not the highest at 2% and only 2.36% of mortgages are delinquent. If you bought property in Arizona around 2011, you are probably patting yourself on the back right now. Median home values in the Grand Canyon State are up 26% from 2011 to 2015. What’s more, we expect that number to keep rising. Population growth from 2011 to 2015, outgrew new homes by 3% in Arizona. Part of that population growth is driven by the migration of property-hungry retirees to the state. The trickiest part of buying a foreclosure in Arizona might be finding one. The foreclosure rate in Arizona is a very low 0.9% and only 1.48% of mortgages are delinquent. The Peach State is yet another good bet for people looking to buy a foreclosed house. Georgia has few things working in its favor like the second-lowest process period on foreclosures in the country at 32 days. It has also seen the 11th-largest increase in median home values from 2011 to 2015. Coming in tied with Georgia in eighth place is Oregon. This state scores in the top 25 for all metrics but one. It also has top 15 scores in increase in demand for housing, median home value change and the foreclosure rate. In particular the 13% increase in median home values from 2011 to 2015 may have some homebuyers salivating. The foreclosure rate is 2.7% so there will be a fairly good stock of foreclosed homes to choose from for people hunting for bargains. South Carolina rounds out our top 10 coming in only one point behind Georgia and Oregon on our index. Buying a foreclosed home in South Carolina will be on the difficult side. The process period for a home foreclosure here is 150 days. That amount of red tape off may scare off some investors but for those who take the plunge it can be profitable. From 2011 to 2015 median home values in South Carolina rose 9.26%. Change in median home values. This is the percent change for median home values from 2011 to 2015. Data comes from the 2011 and 2015 U.S. Census Bureau’s 1-Year American Community Surveys. Difference between population change and housing unit change. This is the percentage point difference between the percent change in population and percent change of housing units from 2011 to 2015. Data is from the U.S. Census Bureau’s 2015 1-Year American Community Survey. Here is an example of how we calculated this figure: In Texas the population grew by 6.99% and the number of housing units grew by 4.84%, thus the difference between the two is 7.07%. Mortgage delinquency rate. This is the percentage of mortgage debt balance which is at least 90 days past due. Data comes from the Federal Reserve Bank of New York and is from 2015. Foreclosure rate. This is the percentage of outstanding mortgages that are in foreclosure. Data comes from the Federal Reserve Bank of New York and is from June 2014. Process period. The process period is the length of time in days it takes from the start of the foreclosure process until the end. This metric attempts to measure the level of legal difficulty of acquiring a foreclosed house in each state. Data comes from RealtyTrac. We ranked each state across each of the five metrics giving equal weight to all metrics. Next we calculated the average ranking for each state. After that we gave each city a score based on its average ranking. The state with the highest average ranking received a score of 100, while the state with the lowest average ranking received a 0.